Sapa District is located in Lao Cai Province, north-west Vietnam, and 380 km north-west of Hanoi, close to the border with China. The Hoang Lien Son range of mountains dominates the district, which is at the eastern extremity of the Himalayas. This range includes Vietnam’s highest mountain, Fansipan, at a height of 3143 m above sea level. The town of Sapa lies at an altitude of about 1500 meters (4921 feet) above sea level. The climate is moderate and rainy in summer (May – August), and foggy and cold with occasional snowfalls in winter. 6h30 – 6h45: The tour begins between with a bus or taxi transfer to the bus office in Hanoi where you will catch the day bus to Sapa. 12h30 – 13h00: You will arrive Sapa. Tourguide would pick up you there. After you check in hotel, rest for a short spell to take bath. You have any time to prepare your baggage for your trek. Then you have luch in your hotel. You should bring a comfortable shoes to trek. 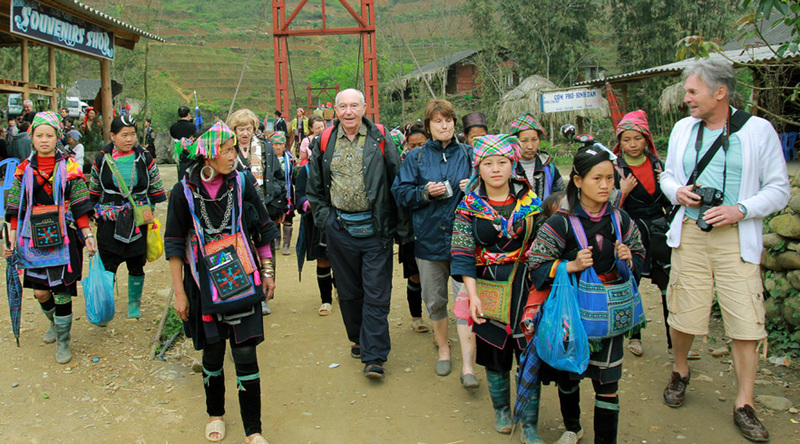 You will start the half-day walk to Cat Cat village occupied by the Black H’mong tribe. You will experience the tribal way of life while enjoying wonderful views of the terraced rice paddy fields and the waterfall in Cat Cat. 17h00 – 17h30: After the walk, you will be back to the hotel. 19h00 – 20h00: have dinner in the hotel restaurant. For the rest of the evening, you will be free to explore Sapa town at night time on your own. You will spend the night in hotel. 6h30 – 7h00: After having breakfast, you will check out hotel. You will only need to bring a change of clothing, trekking gear and toiletries for your stay at the village homestay. 21h00 – 21h30: You will arrive in Our office 12 Ly Thai To and the end of trip.